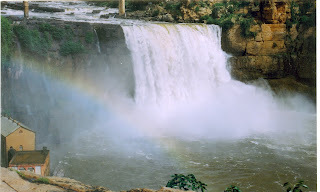 The Gokak Falls is a waterfall located on the Ghataprabha River in Belgaum district of Karnataka, India. 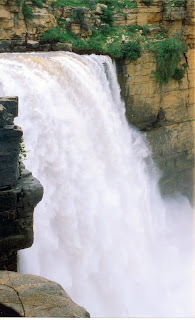 The waterfall is six kilometers away from Gokak, a nearby town. After a long winding course, the Ghataprabha river takes a leap of 52 metres (171 ft) over the sand-stone cliff amidst a picturesque gorge of the rugged valley, resembling Niagara Falls on a smaller scale. The waterfall is horse shoe shaped at the crest, with a flood breadth of 177 metres (581 ft). During rainy season, the thick reddish brown water sweeps far over the brink of the cliff with a dull roar that can be heard from some distance. There is a hanging bridge across the river, measuring about 201 metres (659 ft). Its height above the rock bed is 14 metres (46 ft). One of the interesting features of this place are the monuments from the Chalukya era that are present on either banks of the rocky gorge. There is an old electricity generation station which used to generate electricity during 1880s. A ropeway connects the power station to the cliff top. July to September is the best season to visit the place. The Gokak Falls can be developed into a fine tourist attraction. • Miraj - All express and superfast trains stop at Miraj station. You can then take another train from Miraj which halts at Gokak or Ghataprabha stations. It is recommended that passengers get down at Miraj junction and then take another train from Miraj which stops at Gokak or Ghataprabha stations. The Godachinmalki Falls is a waterfall located on the Markandeya river in Belgaum district, Karnataka, India. It is 16 kilometers away from Gokak and 40 kilometers from Belgaum, a nearby town. 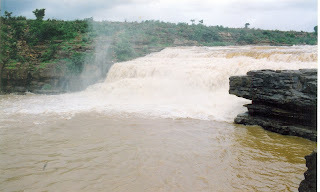 It is located in a deep green valley on the west side of Konnur Road. 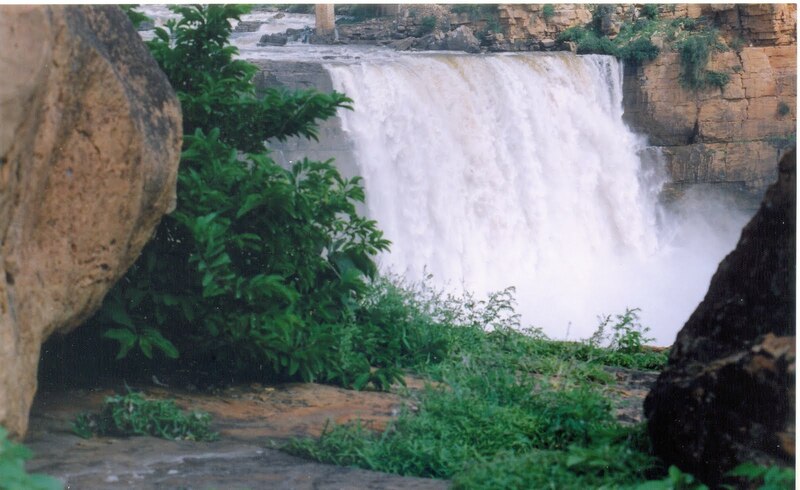 The Godachinmalki falls, also known as Markandeya falls, is located in a rugged valley, which is approachable from Godachinmalki village by walking through an irregular forest route for about 2.5 kilometers. It can also be reached from Nirvaneshwara Matha near Yogikolla, only by foot. Another route is from Pachhapur via Mawanur, which is about 6 kilometers. Presently this water fall is not easily accessible.